A year after ten heavily armed gunmen attacked India’s financial capital Mumbai, families of victims still have lots of unanswered questions. RT talked to some of the families of the Indian soldiers who were slain in the attack. One year down the line, Kavita Karkare, the wife of former Maharashtra Anti Terror Squad (ATS) chief Hemant Karkare, is still seeking answers from the government over the disappearance of the bullet-proof jacket worn by her husband on the night of the 26/11 Mumbai attacks. Mumbai’s hero Karkare died with bullet injuries in his chest, putting the effectiveness of that jacket under question. Karkare received three fatal bullet injuries despite having worn the jacket. The mother of two also filed an application under the Right to Information Act (RTI), but the Maharashtra government has now told her that the jacket was misplaced in the chaos. Initially, the cause of Karkare’s death was given to be a faulty bullet proof jacket, but a post-mortem report later said that he died of a bullet to the neck. 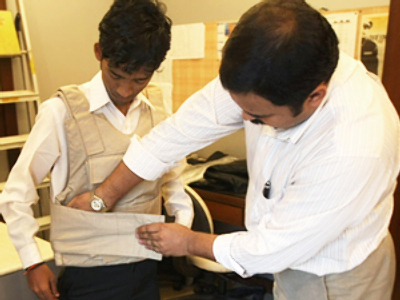 A few months ago, the Maharashtra government was in the midst of a controversy that the bulletproof vest that Karkare was wearing when he was shot was defective. India’s Home Minister P Chidambaram admitted that it was shoddy of Mumbai Police to have misplaced the bulletproof vest, adding that he was sorry for the lapse. Karkare’s wife, along with Smita Salsakar, wife of senior inspector Vijaj Salaskar had a special meeting with India’s ruling Congress Party president Sonia Gandhi last week. While sharing their grief, both brave ladies demanded capital punishment for Ajmal Kasab. Karkare and Salaskar died while fighting terrorists near Cama Hospital. On the anniversary of 26/11, Vinita Kamte, widow of martyr Additional Commissioner of Police Ashok Kamte, has released a book titled “To The Last Bullet” chronicling the findings of her husband’s death. In her book, Kamte criticizes the Mumbai police for being slow in reacting after her husband’s death and has yet to tell her exactly how her husband died. Vinita, with the help of police call records obtained through RTI, has alleged in her book that the police officers lay injured for over 40 minutes before any help arrived. In the book, the brave widow writes that an additional commissioner of police, along with armed men, stood barely 400 metres away from the scene of the action but did not proceed to give assistance. Instead, he chose to go in the opposite direction. Kamte, then ATS chief Hemant Karkare and inspector Vijay Salaskar were killed by terrorists along with three cops that night. Mumbai Police Commissioner D. Sivanandan on Wednesday apologized for the loss of late Anti-Terrorism Squad chief Hemant Karkare's bulletproof jacket. He also admitted to procedural lapses on 26/11. “It hurts me a lot to hear all that and read all this in the newspaper. I am not giving any excuses, but all I can say is that what happened was unprecedented and we were unprepared to handle such things,” he told a local news channel IBN live. “We will look into it and we will find the bulletproof jacket, but there was confusion then and because of that some slip-ups might have taken place,” he added. Most of the family members are still coming to terms with the loss of their loved ones and, not surprisingly, had few demands: punish the perpetrators of the attack and hang Kasab – the lone surviving Pakistani terrorist who is under trial in India. Divya Salaskar, daughter of senior inspector Vijaj Salaskar, who was killed in the Mumbai attacks, says the mere mention of her father brings back horrid memories of that night. During his confession in the ongoing trial, captured terrorist Kasab claimed responsibility for the killing of Salaskar. Does the fact that the lone surviving terrorist Kasab is still alive disturb her? “I think it’s not only Kasab, there are several others also out there. The Indian government should make an attempt to find out every single detail of how the whole thing happened and punish every single person directly or indirectly responsible for it,” she added. K Unnikrishnan, father of Major Sandeep Unnikrishnan, the slain National Security Guards (NSG) commando who died fighting the terrorists in the Taj Mahal hotel carnage, and his wife Dhanlakshmi plan to visit the new Palm lounge in Mumbai on the first anniversary of the death of their son. The lounge is constructed on the very spot where their son died. NSG commando Captain AK Singh was one of those who stormed into the 18th floor of the Oberoi hotel to eliminate the terrorists and rescue hostages. When the terrorists hurled a grenade to keep the NSG commandos away, splinters hit Singh's left eye and badly damaged it. Though the Captain is still serving in the army, he will not be assigned any combat roles anymore. The commando will be assigned administrative tasks and other such duties. However, he will be entitled to all the perks, promotions, and benefits of the army. These are just a small number of brave Indian soldiers and their families who risked their lives over those three days so that the nation could live on. There are dozens of stories of remarkable courage and valor that are yet to be discovered. The sacrifices made by these sons will never be forgotten.